Click on book to buy now! "I lie awake thinking of home. Out-side, winds roar across the face of the mountain, smashing my tent flat against my face. I turn over and burrow deeper into my sleeping bag. Someone shouts outside. "Get up! Pack your gear." One of the guides thrusts his head through the tent flap. "You have to get out of here," he yells. "The tent is going to shred." Read the amazing story of one woman’s courage and determination to overcome fear, poor teamwork, injury and life-threatening storms to become the oldest American woman* to climb the Seven Summits, the highest mountain on each of the seven continents. 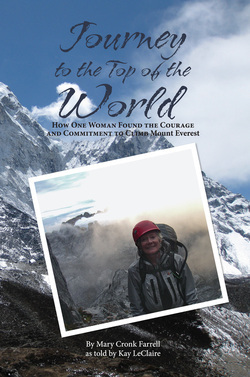 Kay LeClaire reached the top of Mount Everest at age 60.